During the Golden Age of Muslim Civilisation creative new innovative ideas travelled across the land from southern Spain to China – innovations in medicine, astronomy, trade, navigation, architecture, technology, industry, agriculture and much more were common place. In the field of agriculture, innovation meant that farmers were planting new crops, developing state-of-the-art irrigation techniques, using organic fertilisers, harnessing global knowledge in local areas, and basing their agronomy on scientific findings. This all led to an agricultural revolution, harnessing clean energy sources, making fresh food available to more people. Farmers and engineers in the Golden Age inherited existing techniques of irrigation, preserving some while modifying, improving and constructing others. 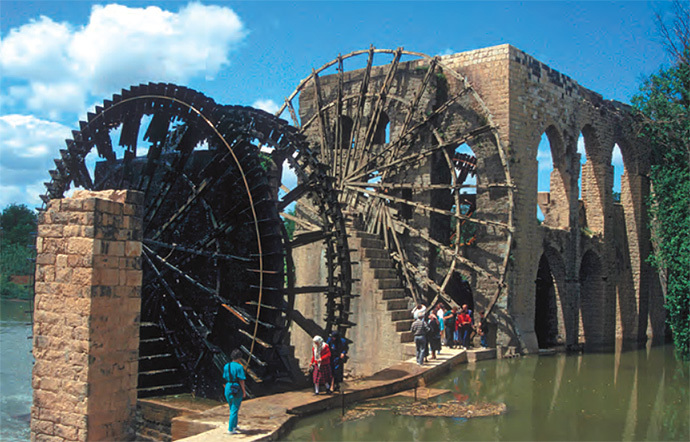 It was common across the Muslim world to see hundreds of windmills and waterwheels busily irrigating crops. However, they did not have the capacity to supply every town and village. Engineers like Al-Jazari designed water-raising machinery aimed to bring water supplies directly to local people and enhance the farming capacity. 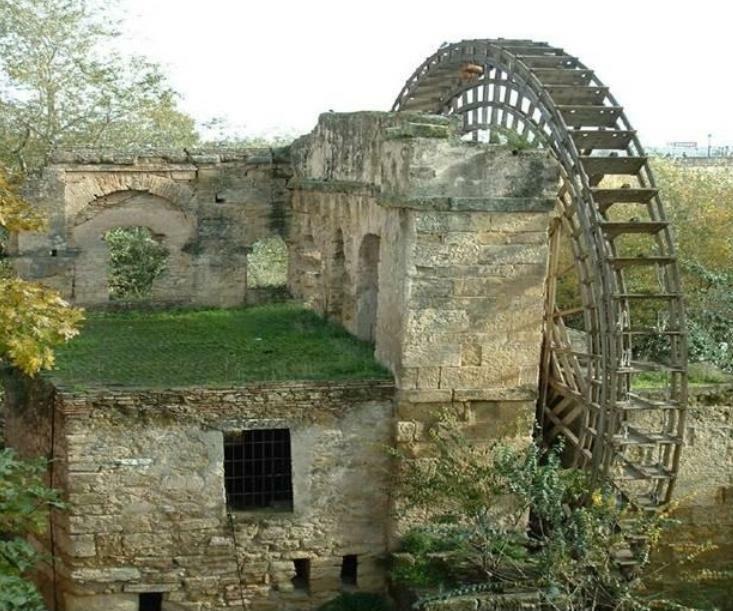 Here we look at a few innovative machines that powered the agricultural revolution in Muslim Civilisation. 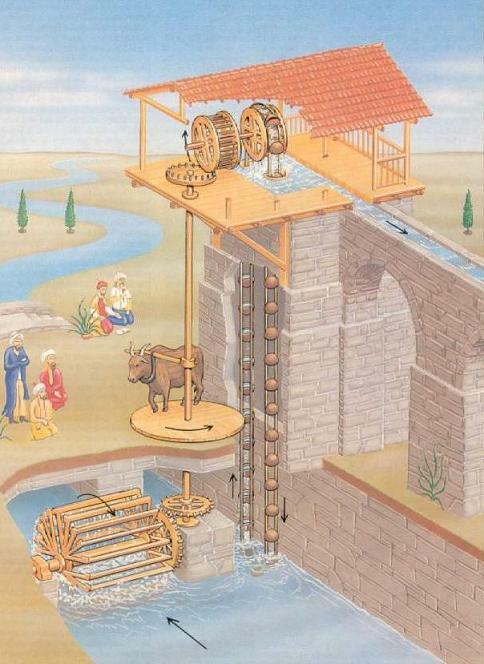 A chapter of Al-Jazari’s book was devoted to water raising machines. 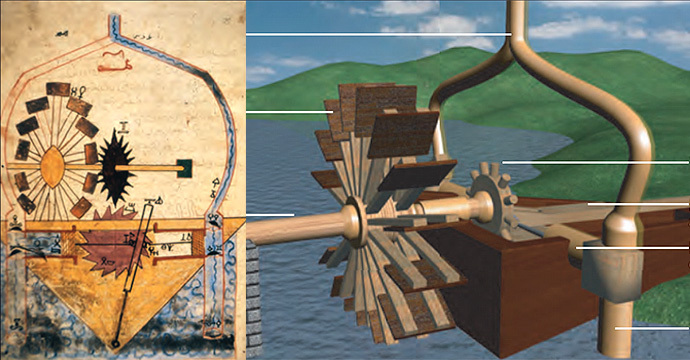 It also included sophisticated machines powered by water and gravity, simulating the principle of the balance (see the video below). 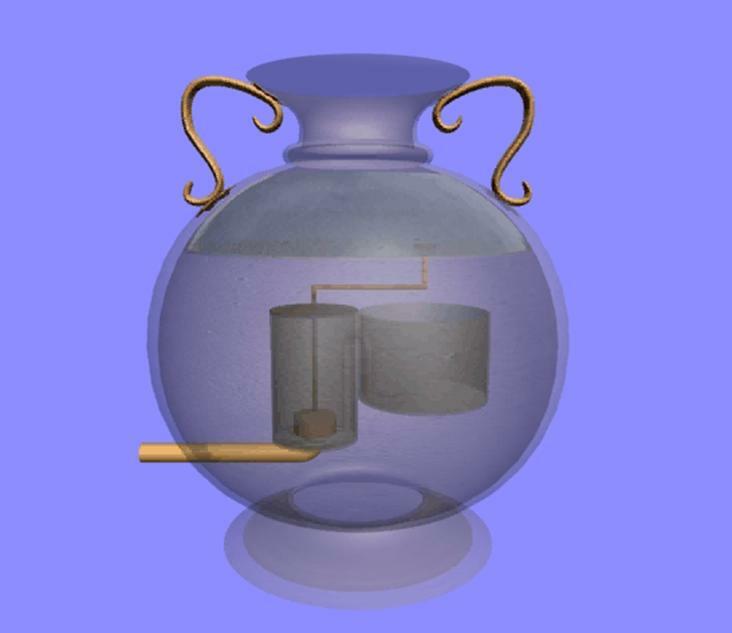 As the water fills one bucket and as it spills into the large cylindrical tank, a siphon sets into action, generating air pressure through a flute and resulting in a sound at controlled intervals. The interval is controlled by the rate at which the water flows from the tap. This is a water-driven twin-cylinder pump. The important features embodied in this pump are the double-acting principle, the conversion of rotary into reciprocating motion, and the use of two suction pipes. 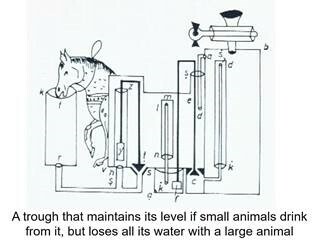 The hand-driven pumps of classical and Hellenistic times had vertical cylinders, these stood directly in the water which entered them through plate-valves in the bottoms of cylinders on the suction strokes. The pumps could not, therefore, be positioned above the water level. 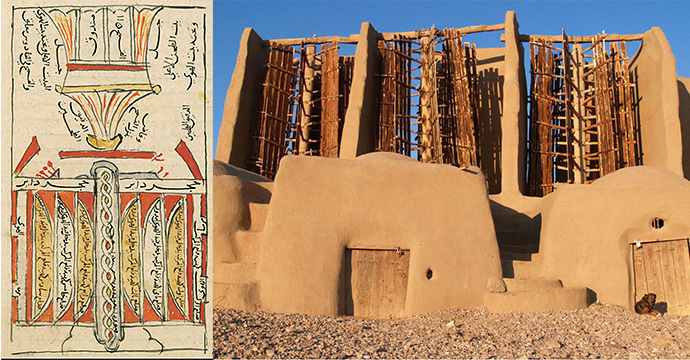 This pump of Al-lazari could be considered as the origin of the suction pump. The assumption that Taccola (c. 1450) was the first to describe a suction pump is not substantiated. 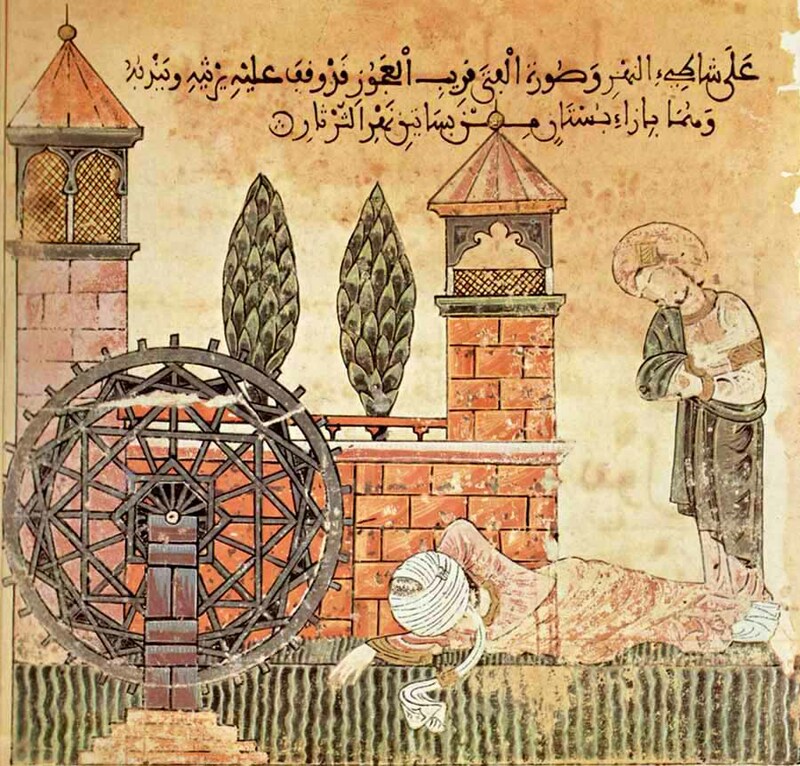 The only explanation for the sudden appearance of the suction pump in the writings of the Renaissance engineers in Europe is that the idea was inherited from Muslim Civilisation, whose engineers were familiar with piston pumps for a long time throughout the Middle Ages. There are multiple other mechanical devices. 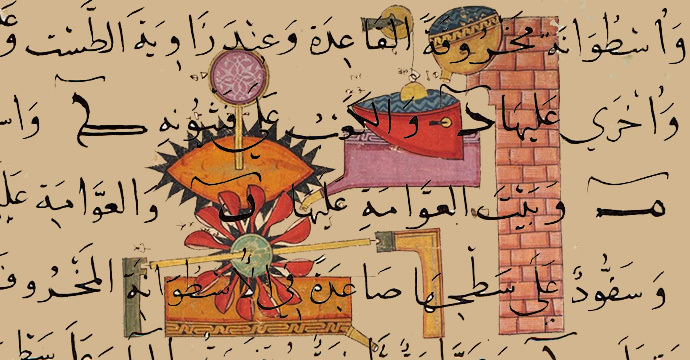 Of these, Al-Jazari has designed three more water-raising machines and many additional ingenius devices like clocks, some of them feature in our previous story entitled “Top 7 ingenious Clocksfrom Muslim Civilisation that defied the Middle Ages”. 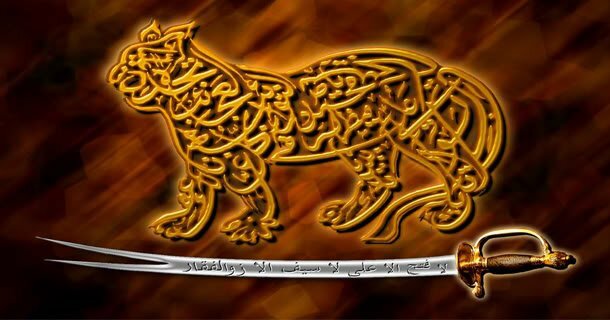 Others include those developed by Taqi al-Din, Al-Muradi and Ridhwan al-Sa’ati. 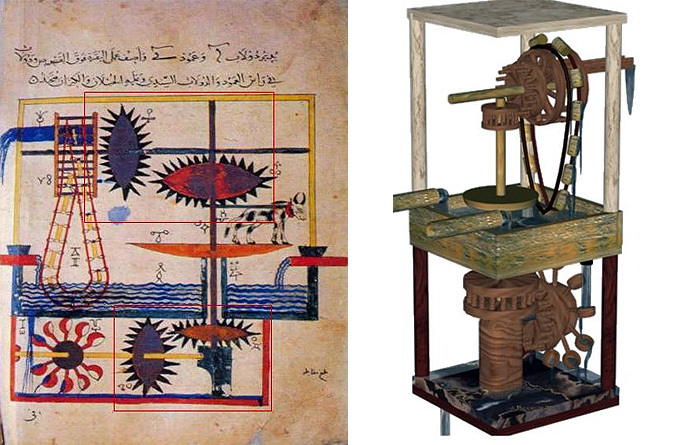 The Banu Musa brothers also produced fascinating machines such as the Hydraulic Organ, wudu’ (ablution) water machine, The Self Changing Fountain and a drinking device for animals (right figure). They also produced trick devices like a drinking bull and tea-making lady robots (See 1001 Inventions book, Trick Devices) and let’s not forget to mention Al-Muradi’s “Book of Secrets“. 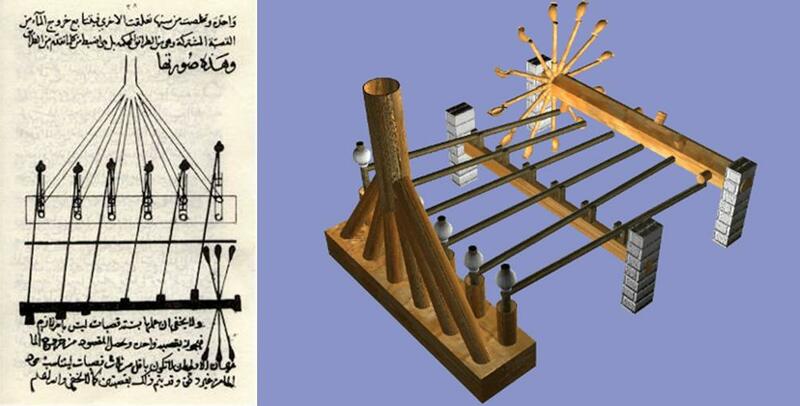 Other devices and tools invented or improved upon from scholars from Muslim Civilisation include a paper-glass-ceramic-pottery making machine, various musical, astronomical, medical, military, agricultural and alchemy instruments. 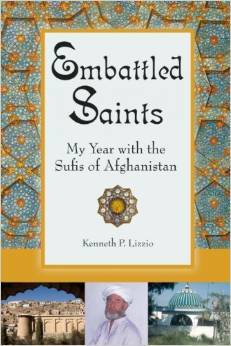 These will be mentioned in our forthcoming stories. 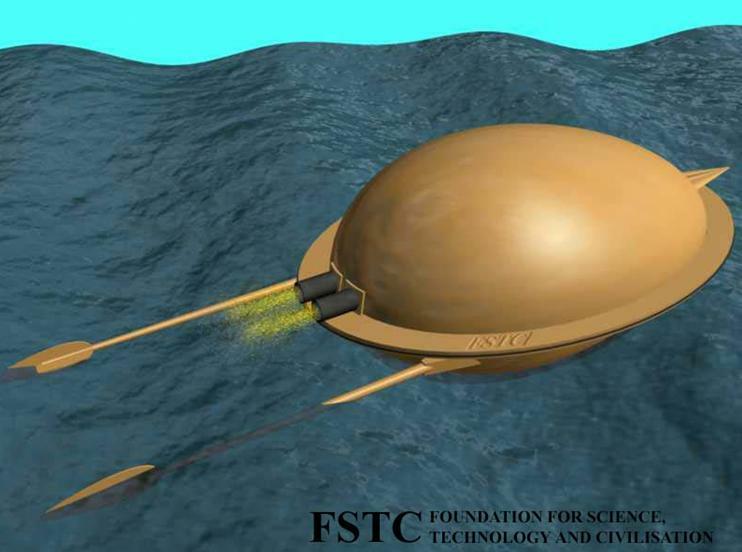 A 3D graphic model of the gun powder propelled Torpedo constructed from the manuscript of Hasan al-Rammah.